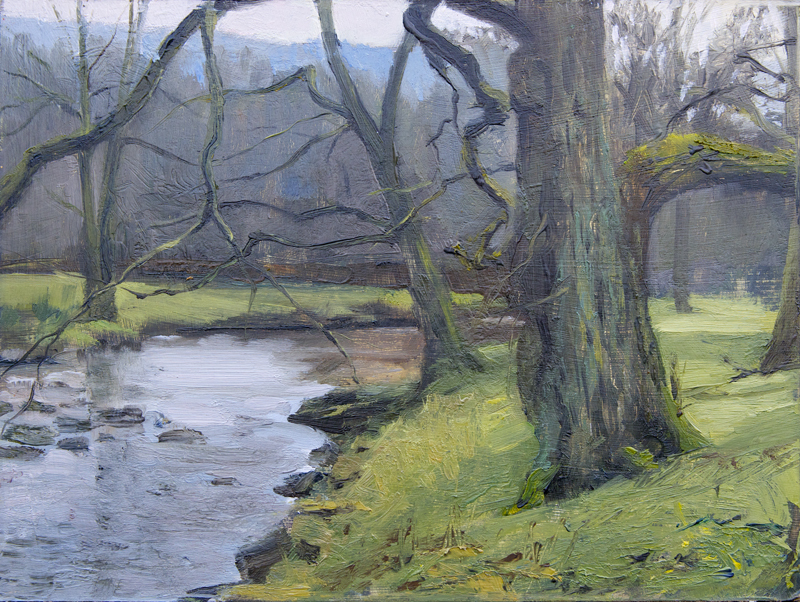 The morning started bright and sunny yesterday, so I set off toward the Trough of Bowland with my paints. I pass through Abbeystead to get there which is a favourite spot of mine and one I've painted before. The view along the river as I passed looked really inviting so I decided to stay there. I set up looking up the river and and worked for about an hour and a half. By now the light had changed and the view I had started had gone. I got to the point where things should be coming together and realised it just wasn't working. So I wiped it off and turned my pochade around facing downstream and painted this one. I've painted this tree before but from the other side. I really like the blue-green colours in the bark and the strange shapes of the trunks.